This typical pre-World War II suburban house shares with the Adams National Historical Site the distinction of being the home of two presidents: George Herbert Walker Bush, the 41st president of the United States, and George Walker Bush, the 43rd president. The George W. Bush Childhood Home pays tribute to the two presidents who lived here, one on the verge of his political career and the other not yet a teenager. George H. W. Bush bought this house in 1951, a year after he moved his family to the booming west Texas town of Midland to establish himself in the oil business. George W. Bush, his first child, was five at the time. The family lived in the house for four years. The first President Bush led the nation during the tumultuous years of the collapse of the Soviet Union, the reunification of divided Germany after the fall of the Berlin Wall, and the Gulf War that drove Iraqi leader Saddam Hussein out of Kuwait. The tragic bombings of the World Trade Center and the Pentagon and the hijacking of Flight 93 on September 11, 2001 have dominated the administration of his son. Declaring “the war on terrorism,” President George W. Bush took dramatic steps to protect Americans at home and abroad. The Bush administration supported and obtained the enactment of large tax cuts and worked with Congress to secure substantial education reforms in the No Child Left Behind Act of 2001, two of its most notable domestic initiatives. When George H. W. Bush and his wife Barbara bought this house on November 7, 1951, Midland was already changing from a small country town into the economic center of the great Permian oil basin that spans west Texas and eastern New Mexico. By 1950, 215 oil companies had offices in Midland and a local developer called it the “headquarters of the independent oil man in Texas.” The simple one-story frame house, built in 1939, was one of the first in its subdivision. An original brick chimney and large projecting bay window, added when the attached garage became a den, dominate the front elevation. The complex low-pitched hipped roof of red shingles contrasts with the olive green clapboards and the red brick detailing at the top of the chimney. The compact, efficient layout includes a living room, den, and eat-in kitchen at the front of the house. A narrow hallway separates the three bedrooms and one bath from the public spaces. Restored to the appearance of the Bush residency, significant interior features include the original “knotty pine” paneling in the living room, den, and master bedroom; original cabinets and hardware; a phone niche; an original light fixture; and the wallpaper from the Bush occupancy. 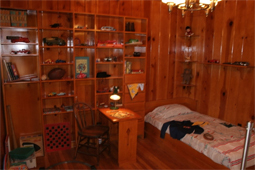 Hardwood floors are present throughout the home with the exception of the kitchen and bathroom. The neighborhood was close enough to downtown Midland for young George and his friends to ride their bicycles to the movie theater. Born to a wealthy family in Massachusetts in 1924, George H. W. Bush was a decorated Navy fighter pilot in World War II, who flew 58 combat missions. Shot down by Japanese antiaircraft fire over the Pacific and rescued by an American submarine, he received the Distinguished Flying Cross for his bravery in action. When he returned home from the war, he married the former Barbara Pierce, whom he had met as a student at Phillips Academy, and enrolled in Yale University. Graduating in 1948 as a member of Phi Beta Kappa, he entered the oil business as a sales clerk but soon started his own independent oil development company. As his business prospered, he moved to a larger house in Midland in 1955 and to Houston four years later. When he left active management of his company in 1966, he was already a millionaire. That same year, Bush began the first of his two terms as a member of the United States House of Representatives, following his father into politics; Prescott Bush served as United States senator from Connecticut from 1952 to 1963. Unsuccessful in two campaigns for the Senate, George H. W. Bush next served in a series of high-level appointed positions, including ambassador to the United Nations, chairman of the Republican National Committee, chief of the U.S. Liaison Office to the People’s Republic of China, and director of the Central Intelligence Agency. After challenging Ronald Reagan for the Republican presidential nomination, he accepted the vice presidential nomination in 1980. Vice President Bush had a large role in both foreign and domestic dealings, including Federal deregulation and anti-drug programs. Winning the presidential nomination eight years later, he easily defeated Democrat Michael Dukakis in the election of 1988. His international experience as vice president served President Bush well. His diplomacy smoothed the way, aiding the relatively peaceful transition from the Cold War into a new era of American and Russian relations. It was a time of dramatic change with the fall of the Berlin Wall, the collapse of the Soviet Union, and the resignation of former Soviet leader Mikhail Gorbachev; but Bush received high marks for his restrained handling of this volatile situation. In Latin America, he sent American troops into Panama to overthrow the corrupt regime of General Manuel Noriega. When Iraqi dictator Saddam Hussein invaded Kuwait, Bush put together a powerful international coalition to oppose him. The dramatic allied victory in Operation Desert Storm was a high point of his presidency. Foreign policy dominated Bush’s administration, and his pursuit of a “kinder, gentler nation” did not include a large amount of domestic legislation. The Bush White House supported the Clean Air Act and the Americans with Disabilities Act. Problems on the domestic front eventually overwhelmed Bush’s popularity following the Gulf War. A faltering economy, rising violence in the nation’s cities, high budget deficits, and the difficulty of maintaining his “no new taxes” campaign pledge hurt him in the 1992 election, which he lost to Democrat William J. Clinton. Born in 1946, the first of six children, George W. Bush was five years old when his family moved to the house on Ohio Avenue. The Bushes moved frequently during George W. Bush’s childhood. The four years he lived here were formative ones, and the house figures prominently in family memoirs. It saw the birth of two of his three brothers and the tragic death of his sister Robin from leukemia in 1953. George attended Sam Houston Elementary School while the family lived in this house, and he began to play baseball. At the end of 1955, the family moved to a larger house in Midland. 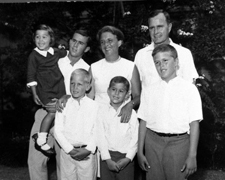 Like his father, Bush attended Phillips Academy in Andover, Massachusetts and Yale University, graduating in 1968. After receiving a master’s degree in business administration from Harvard Business School in 1975, he returned to Midland to work in the oil industry. In 1977, he married Laura Welch, a teacher and librarian born in Midland. George W. Bush worked on his father’s 1988 presidential campaign. In 1989, he and a group of partners bought the Texas Rangers baseball franchise. He was managing general partner when elected governor of Texas in 1994. Successful in his reelection bid in 1998, he was the first Texas governor ever elected to two consecutive four-year terms. George W. Bush began his presidential campaign in 1999. In the extremely close contest between Bush and Democrat Albert Gore, Jr. in 2000, reminiscent of the disputed Hayes-Tilden election of 1876, the United States Supreme Court did not confirm Bush as the winner until December 13, more than a month after Election Day. Bush won reelection in 2004 in another close contest, this time with Democrat John Kerry. In domestic affairs, President Bush has cut taxes, obtained significant education reform, expanded Medicare to include prescription drugs, and emphasized and embraced the contributions of local and voluntary organizations to the nation’s welfare. After the terrorist attacks on the United States on September 11, 2001, President Bush has aggressively sought to protect the nation at home and root out terrorist organizations around the world. He has worked to strengthen the nation’s defenses through the establishment of the Department of Homeland Security that consolidates and realigns government agencies into a new agency charged with protecting the homeland. He sent troops to Afghanistan to hunt down the men responsible for the attacks of September 11, resulting in the defeat of the oppressive Taliban regime. In March 2003, a U.S.-based coalition invaded Iraq in search of weapons of mass destruction. The war effort was joined by more than 20 other nations designated the "coalition of the willing." The war efforts overturned Saddam Hussein’s government. Captured by American forces and brought to trial under the Iraqi interim government set up by the U.S.-led coalition, Saddam was convicted and executed. Subsequent owners made a number of changes to the George W. Bush Boyhood Home after the Bush family moved out in 1955. 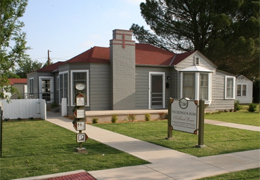 In 2001, the Permian Basin Board of Realtors in Midland bought the house and created the George W. Bush Boyhood Home Foundation to restore it to its appearance when the Bush family lived there. The house opened to the public in 2006 with the first phase of restoration complete. First Lady Laura Bush, former President George H. W. Bush, and his wife Barbara attended the dedication. The second phase of the restoration project will include construction of a permanent exhibit and educational center. The George W. Bush Childhood Home located at 1412 West Ohio Ave., Midland, TX is listed in the National Register of Historic Places. The home is open Tuesday-Saturday from 10:00am to 5:00pm, and Sunday from 2:00pm to 5:00pm. It is closed Thanksgiving Day, Christmas Day, and New Year’s Day. An admission fee is charged. 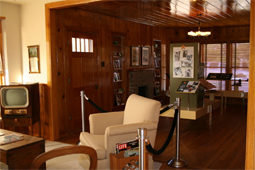 For more information, visit the George W. Bush Childhood Home website or call toll free 1-866-684-4380.